Shy boys and girls soon started to speak English. Crying babies began to smile instantly. Cloudy’s magic made the ward filled with wonder and laughter. 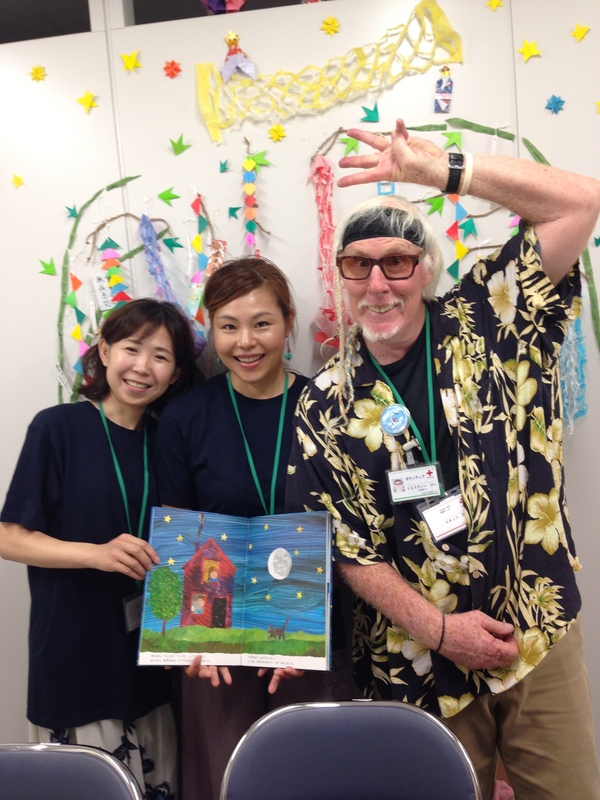 The new artists Satoko & Yukari joined the activity and Cloudy seemed looked happier in the volunteer room than usual. 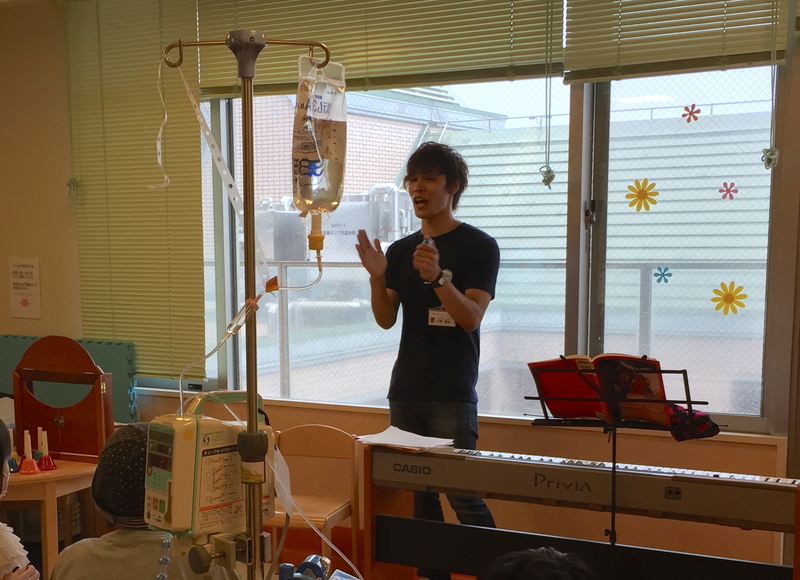 Songs for little kids and music of teenagers’ favorite were played and sung by Mari-san. She sung Eric Carle’s “The Very Hungry Caterpillar” to the melody and the assistant turned the pages along her singing, which was a little surprise. 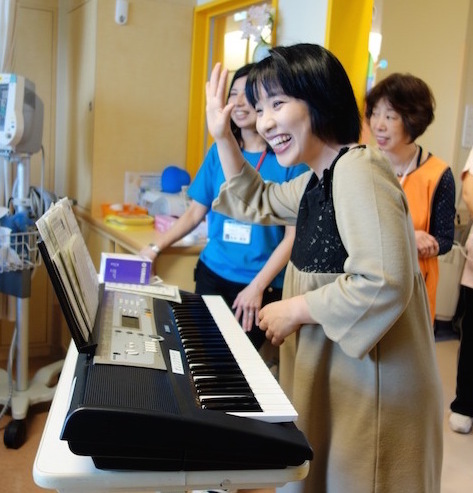 Her beautiful voice and wonderful piano play is always big refreshment for children and their mothers as well as hospital staffs. Everyone enjoyed Mari-san’s unconstrained and transparent singing voice. She accepts any kind of music, which made children really happy and satisfied. 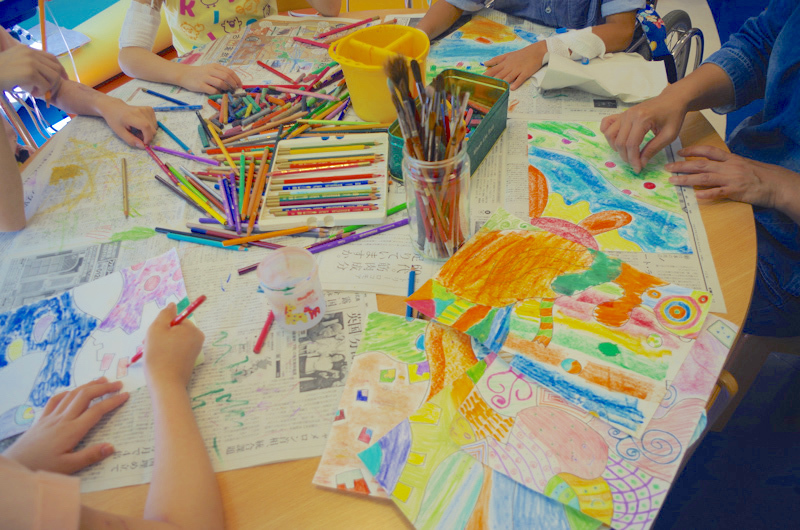 Cell artist Ouma’s huge art work cut in pieces of A4 size were given to children for coloring. 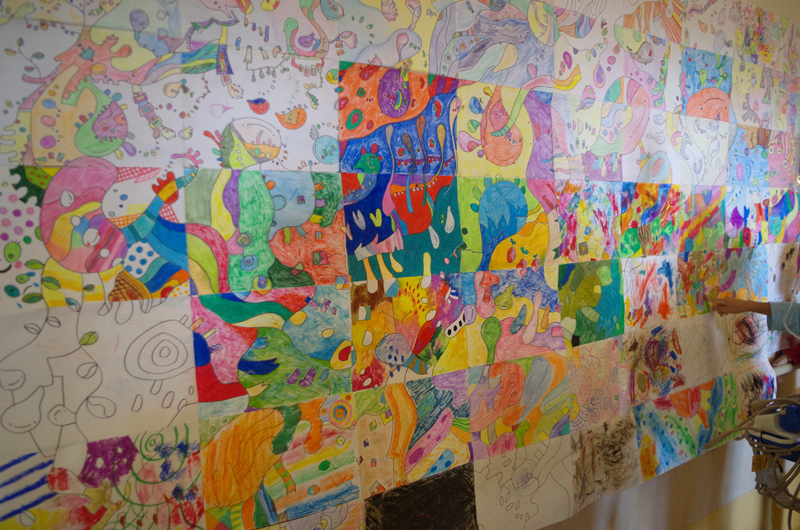 All the work were put together back and made a huge art work. After that, It was displayed on the wall of the ward. Everyone there including nurses and doctors enjoyed the exhibition. 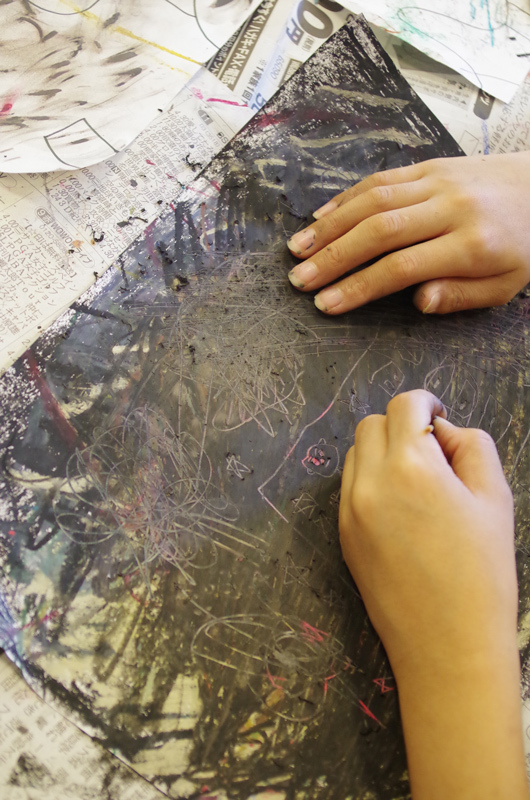 The first visit for the craft artist Hisako-san. She introduced her original-designed karakuri craft to children in the playroom. After they made one, each child tried to make her original ones. 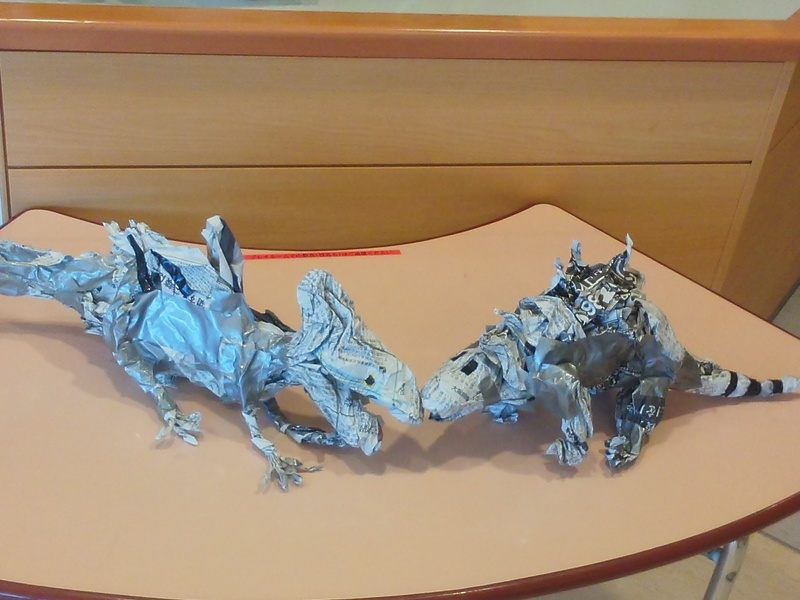 They enjoyed it and were really surprised at their work to find its karakuri mechanism, which made them smile and happy. A boy of 6 years old joined the activity and it had been a few days since he took surgery. He was so eager to create many monsters. A huge alligator snapping turtle was his first work. He wanted to take it home on being discharged but he worried if his mother would throw it away. Then he decided to make an igunana to put it in his room. But again, he started to worry if his 2 years-old brother would brake it. But never mind. He’d never stopped creating till he finished his cool chameleon. Though he sometimes showed a feeling of lonliness or a worried look, he really looked happy on approaching completion and success. He really looked sprended!